Beyzaie's literary heritage, from his parents, is reflected not only in his prose writings, his plays and films but also in his own personal style and critical outlook. Besides his monograms in volumes on Iranian, Japanese and Chinese theaters and also a book on Hitchcock films, he has done extensive research on the roots of One Thousand and One Nights resulting in two monograms, Seeking the Roots of the Old Tree followed by another about the missing ancient book of Hezar Afsan[One Thousand and One Night as it is called in its Arabic translation]. 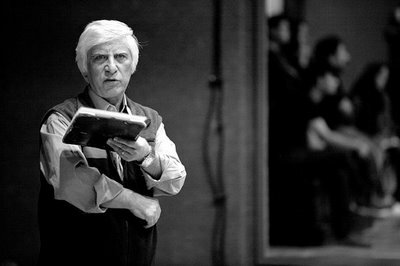 Mr. Beyzaie has been a very prolific playwright and, amazingly, the large body of his work shows a consistent artistic vision with recurrent themes, one of his more prominent themes is his treatment of Iranian cultural myths and the reinterpretations of them for a modern era.